Indoor cats have it rough. It's hard enough for them to squelch their instincts to hunt, but they have to stay in the same environment day in and day out. B O R I N G for a cat. 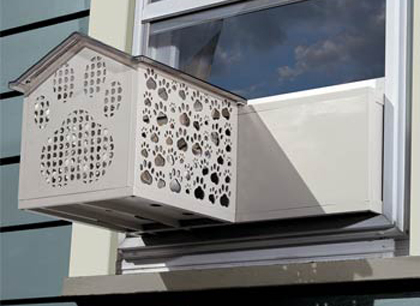 Korean company Monotech, has solved the boredom problem -- well, just a tad -- with a hanging cat enclosure called the Let Meowt® Window Cat Patio which, like an air conditioning unit, can be installed in up-and-down opening windows. The Window Cat Patio retails for $149. This looks like a good idea; the Let Meowt® has even won a few awards at pet expos. But at these dimensions - L23.5" X W18" X H9.25" - it's just too small for a cat to hang out in. Cats like to stretch out, often to their full length, which can be up 4 feet for a medium size cat. So, my verdict is, the Let Meowt Window Mount Cat Patio may be a good thing for kittens or very small cats. It's not a hang-out for the big cats. Cats + Newton's Cradle = The Physics Lesson Animal Video of the Day!! !